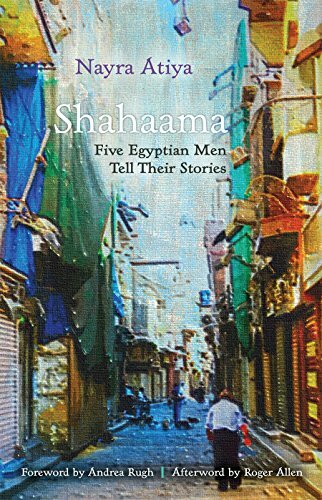 Nayra Atiya has compiled a fascinating selection of the life stories of five Egyptian men belonging to a variety of sub-cultural, socio-economic and religious backgrounds. She conducted the interviews during the period from the late 1970s to the early 1980s with men who appear to have been born between the 1940s and the 1950s. Each life history provides details about the men’s childhoods, educations and adult lives during the period from the early decades of the Republic through the early Mubarak period, with these oral histories reflecting a great deal about the many socio-economic and political changes that accompanied those decades. Atiya has made fruitful choices in the interviewed subjects in that they convey some of the multicultural aspects of Egypt, with its socio-economic, religious and ethnic diversity. Atiya presents her first interview with fisherman Mohammad Maghrabi, whose wife she featured in her collection of oral histories of Egyptian women, “Khul Khaal,” published in 1982. The life of “Nader Ali”, identified by a pseudonym like all the other interviewees except Mohammad Maghrabi, offers an insight into growing up in the Delta in an agricultural area Ali provides a rich tale of his childhood in Qutur al Mahatta including brushes with a cholera epidemic and the complexities of being a student in the early days of the Republic while the Ministry of Education changed policies about all levels of education for children and youth. The tale helps us to understand the complexity of culture in this rural area which still, in some ways, had more “progressive” policies for education than the nearby town of Tanta. Unlike in Tanta, which gender-segregated school children, in Qutur al Mahatta, they schooled boys and girls in a co-educational setting, which “Nader” reflects upon favorably. Yet another oral history, that of “Nader Bestawros” offers insight into the experience of a Christian living in Upper Egypt, and how some Christian families dealt with members who converted to Protestantism. This story, like the others, also illustrates the fact that many Egyptians moved from their natal villages to nearby cities and towns in pursuit of education and work. Atiya also includes the fascinating story of "Youssef Salman," of North African Jewish heritage, who grew up in Alexandria. He remembered Egypt and Egyptians fondly in many ways despite his complicated political, religious and cultural loyalties and identifications. This well-written, and researched book holds wide appeal, and will be of interest to general readers. It will also prove a useful resource for historians and ethnographers of Egypt and the Middle East. This review appeared in Al Jadid, Vol. 20, No. 71, 2016.